An essential part of Physiotherapy is exercise prescription. Both in the elite and sedentary population. Exercise plays an important role in improving performance and functioning of the body part under rehabilitation. In addition to this, there are also benefits to exercise for the non-injured population. If recovering from an injury benefits of exercise rehabilitation include improved flexibility, movement control, stability and sport specific movements. Furthermore, we can prescribe exercises to ensure that you are optimally placed to prevent and reduce the risk of injury. This prevention is ideal in the pre-season phase of your training schedule. 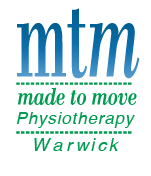 The Physiotherapists at MTM Physiotherapy Warwick are passionate about exercise and movement based rehabilitation and will ensure that you are an active participant in your rehabilitation. With the use of court space at Warwick Stadium and the Functional and high performance Warwick Workout Gym, you will be appropriately guided through your rehabilitation. Exercise, in general, is excellent for people and this has been a well-established fact for an extended period of time. Physical activity can improve your health and reduce the risk of developing several types of diseases such as cardiovascular problems, obesity or diabetes. As well as the long term benefits of exercise it can result in improved quality of sleep as well as mental health. Furthermore, one of our Physiotherapists, Matt Beavis has completed a double degree in Exercise and Sports Science and is highly skilled in the prescription and delivery of exercise programs for both the general and elite population. Below are just a handful of conditions and people that Matt can help! In addition to this, Rachael Dodds runs group pilates onsite at the clinic. Catering from beginners to advanced, male to female you will be sure to find great benefit and enjoyment from Rachael’s classes. These classes run on Monday and Thursday nights from 7-8pm and Tuesdays 130-230pm. If you are interested in finding out more about these classes, then do not hesitate to contact Rachael at the clinic.